Limestone and travertine are favored as a patio or deck surface because their textured appearance blends well with the surrounding environment. Nalboor Tiles carries two of the most commonly used limestone shades, both of which easily replace existing white limestone tiles. Our Shell Reef limestone and Saturnia Ivory travertine are luxurious in their brilliance, and both styles have been expertly crafted, shaped, and brushed. Limestone deposits form in areas where heated water percolates through a sedimentary rock layer. The stone is rather easy to cut and shape, and it is for this reason that limestone has been used in construction for more than 2,000 years. Many of the historic buildings in Rome and other parts of Europe and Western Asia are covered with limestone or travertine tiles. On the downside, sedimentary rock tiles can be somewhat porous, allowing for moisture intrusion. Some of the finest limestone and travertine tiles available today have been sealed with a special compound prior to honing and brushing. This makes them much more water-resistant and means less maintenance on the part of the property owner. White limestone is shiny and has medium-high reflectivity. White limestone has only slight veining or splotching patterns, the composition of which is actually sedimentary contaminants. The brilliant shine of this natural stone makes it a favorite for outdoor patios because it tends to brighten up the entire area even when the amount of natural sunlight is low. The light shade of this material also allows for a great deal of design possibilities for furniture, rails and posts, and rock walls that may be part of the patio construction. Designing an outdoor patio takes some imagination. The last thing the designer wants is a drab, poorly accented sun deck with little or no color complement. White limestone is the perfect base material for a patio because the accent shades of the furniture, rock walls, rails, and steps can be of almost any color. Travertine is a form of limestone, usually darker in appearance with a good deal of splotching. This natural stone is rougher in appearance and the tiles often have pockmarked edges. However, this lends a very rustic, elegant look to the indoor or outdoor environment where the stone is used. Nalboor Tiles features an affordable alternative to luxury white limestone. Our Saturnia Ivory travertine is of a very light shade, has been carefully honed and filed, and blends well with neutral and dark shades used for outdoor deck furniture. This material is of the very highest quality and will last for many years as a patio surface cover with a minimal amount of maintenance on the part of the property owner. The primary concern when quarrying natural stone is its extreme weight. In other words, the labor costs are very high, especially when it comes to transporting the material, packing it securely into containers, and shipping it to its eventual destination. The retail price of natural stone tiles can be as high as $10.00 per square foot, but purchasing from a direct importer and wholesaler can make these beautiful, natural stone products much more affordable. Stonexchange is an importer and distributor of white limestone tiles. We operate our own manufacturing and fabrication center overseas, and we import vast quantities of this material on a consistent schedule. This means lower prices for our customers, especially when they order material in bulk. Most installers and construction contractors look for a wholesaler that can provide large amounts of similar material. Outlet stores and home improvement centers often contract with a direct importer to fill orders placed by commercial clients. This is what our company specializes in, and our premium quality material is available throughout the calendar year. The larger the order, the greater the savings. Our white limestone tiles are priced according to the size of the order placed by the customer. 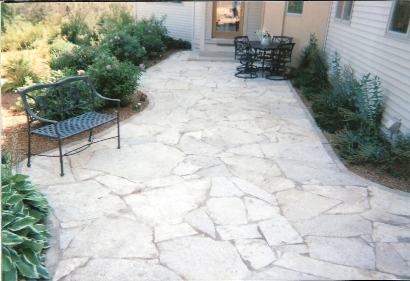 For example, our Shell Reef limestone can cost as little as $4.95 per square foot when ordered in bulk quantities. Our beautiful Saturnia Ivory travertine is priced as low as $2.95 per square foot on large orders. These costs are determined by the amount our company pays to have the material cut and shaped, honed and/or brushed, and shipped in large ocean-going freight containers to our warehouse and distribution center in Miami, Florida. We ship our products throughout the continental United States, and our customers include construction subcontractors, flooring product retail merchants, and independent installers. The Nalboor Tiles website is the showcase for the natural and engineered stone tile products available from Stonexchange. Customers can view the material shade and texture, check out the standard size tile dimensions, and contact us directly for pricing information. Because limestone is rather easy to cut into smaller tiles, the standard size of our products is the same as what is seen in retail flooring product stores and showrooms. Our Shell Reef Limestone tiles are cut to an industry standard thickness of 5/8-inch, and the pieces are 24″ X 24″. Our inventory of cream/beige Saturnia Ivory travertine is 12″ X 12″ with a thickness of 5/8-inch. Both of these products are available for immediate packing and shipping to the customer address. However, our company has long recognized the potential customer market in the area of non-standard size natural stone products. We can customize an order to include larger tiles for outdoor patios. This is an important corner of the market because many property owners choose a patio deck style that incorporates a pattern of odd-shaped, larger pieces. These designs often include the use of inset pieces made from travertine. Stonexchange does not charge customers extra for the filling of orders containing non-standard size pieces. Large orders that include custom-cut tiles may have to be fabricated on an order-demanded basis, resulting in a lead time of up to two months before delivery date. The customer will save money on bulk orders of non-standard size natural stone products when ordering direct from an importer, and the lead time requirement is generally not a problem for installers and subcontractors. Our white limestone and ivory-shaded travertine tiles were once part of a large slab of material taken from a quarry. The sheets of rock were thinned, the tiles were cut using specialized saws, and the individual pieces were then honed or brushed, given perfectly straight edges, and packed into huge containers for transatlantic shipment. Stonexchange imports these tiles on a constant basis in order to keep our warehouse full of product. The featured tiles seen on the Nalboor Tiles website are the most commonly requested products in the industry. This is why we can offer lower prices on bulk orders. Our cost savings on the importation of large quantities of material is passed along to our commercial customers. Orders are usually filled in just one or two business days. The material is carefully packed onto pallets or inside sturdy shipping crates, loaded onto a freight van, and sent directly to the customer address. The destination may be a flooring product merchant or dealer, a construction site, or a home improvement outlet store. Our experience in the shipping industry has given us plenty of statistical information concerning product breakage. We allow for a minimal amount of damage when determining the final cost of our product. We can proudly say that our company has one of the finest in-house quality assurance programs in the industry, and our customers experience very small amounts of product damage when they receive their shipment. Mixing and matching of product is no problem when dealing with Stonexchange. If the building project is for an outdoor patio covered with luxury white limestone, the required materials may also include paver stones, travertine for the garden path, and travertine inset pieces for the patio itself. We can provide the customer with each and every one of these products and can usually send them as a single order. Whatever amount of limestone tiles you need for your building project, Stonexchange has the product at the price you’ve been looking for. We offer the lowest per-piece pricing in the industry on bulk orders of luxury white limestone, but all who order from us will save money. Dealing directly with the manufacturer and importer means you have a pipeline to the material source, and the result is lower costs. Check out the products on the Nalboor Tiles showcase pages, and contact us today for the best deals on natural stone products, particularly white limestone tiles. We know that you will see the difference between what we offer and the best you can expect to get from a local retailer. The most luxurious limestone tiles for outdoor patios are more affordable than ever before, and they are available for wholesale purchase from Stonexchange.